The weather has certainly turned and I have had to grab a coat on the School run on more than one occasion this week. The heating, however, won’t be going on just yet but I have treated us all to new PJ’s, Slippers and warm fluffy Dressing Gowns to pop on when we get home from School – please tell me I’m not alone in trying to keep the heating off for as long as possible. I also love to make nice family meals to warm us from the inside, and the slow cooker is one of my favourite ways of making these meals. I can do the School run, come home, pop it on and then when the kids are home from School asking for snacks as they are ‘starving’ they have dinner ready for them. This is a new recipe we have been enjoying recently. Then, cut them into slices and then cutting the slices in half. Add to the slow cooker. Remove all the leaves from the rosemary stem and finely dice them. Add pork chops to the slow cooker. Open a can of cream of mushroom soup and add to the cooker. Add heavy cream and rosemary. Stir all together as best as possible. Add lid and cook on low for 6-8 hours. Once finished, serve with sauce. 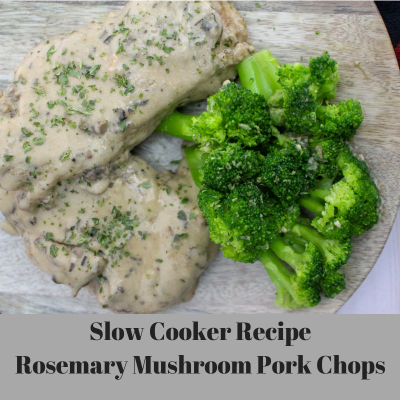 What are your favourite slow cooker recipes?